An amateur archaeologist has unearthed what is believed to be evidence of one of England’s earliest Christian monasteries in a dig on Lindisfarne. The rare grave marker, thought to be from the mid 7th-8th Century, has been described as a “stunning find”. A £25,000 project off the north-east coast was crowd-funded by 200 donors, including 60 who took part in the dig. Project leader Lisa Westcott Wilkins said the name stone was “absolutely fantastic diagnostic evidence”. “It was a spectacular moment and, even better for us, is that…it wasn’t found by one of the team leaders or experts, it was found by a member of the public who had helped to fund and make the project possible,” she said. The name on the stone, ending in the common Anglo-Saxon “frith”, is half visible and the team is waiting for experts to decipher the rest. Project co-director Dr David Petts, of Durham University, said it was a “stunning find, of exactly the period we’re looking for”. “It’s unimpeachable evidence for Anglo-Saxon activity and confirms we’re hot on the trail of the very earliest monastery here in Lindisfarne,” he said. The name stone is believed to date from around the time the monastery was built in 635AD. Its location has, “surprisingly”, never been properly established, Dr Petts said. It was thought to be near the later medieval priory, the ruins of which remain, but there had been “no clear archaeological evidence to back this assumption up”, he said. Fragments from a 10th Century Anglo-Saxon stone cross have been discovered in a Lincolnshire rectory garden. One stone was discovered during maintenance work at St James’ Church rectory in Louth, while church verger Christopher Marshall found the second. Historians said the stones are proof that Louth was an important centre for Christianity in medieval times. Verger Mr Marshall believes the stones are the earliest Christian artefacts to be found in the town. It is thought the cross would have been on a 3-4m (10-13ft) plinth. Built in the 15th Century, St James’ Church on Eastgate has an imposing 295ft (90m) spire overlooking the town. The discovery of the cross provides a link between the present church, an 8th and 9th Century Anglo-Saxon monastery, and the town’s 10th Century shrine to the Anglo-Saxon bishop of Lindsey, St Herefrith. Conservation work will begin on the stones in summer, and they will go on public display in the church later this year. A hoard of historic Viking treasure found in a field has been declared treasure. The haul, which includes ancient ingots and fragments of coins dating back almost a thousand years to the time of King Cnut the Great, was found by treasure hunter Walter Hanks from Llanllyfni, near Caernarfon, using a metal detector in nearby Llandwrog back in March. A total of 14 silver pennies produced at Dublin under the Hiberno-Scandinavian ruler Sihtric Anlafsson (989-1036), which archaeologists say are rarely found on the British mainland, also make up part of the find. Eight of the coins date back to AD 995 while the other six were believed to have been produced in AD 1018. Experts believe that the hoard was purposely buried in the ground between 1020 and 1030 in a bid to store the silver – and could even have been used as part of a burial ritual. The astonishing discovery was officially declared treasure by the North West Wales coroner Dewi Pritchard-Jones during an inquest at Caernarfon. A spokesperson for National Museum Wales could not confirm the value of the coins and said the museum is seeking to acquire the hoard with grant funding from the Collecting Cultures stream of the Heritage Lottery Fund. The spokesperson added: “Now that the hoard has been declared treasure by the coroner, the next step will be to courier this to The British Museum for temporary safe keeping. “The independent Treasure Valuation Committee, will commission an expert valuer to offer their view on current market/collector value and the committee will consider this, before making their recommendation. Finders and landowners are consulted and are able to offer comment or commission their own valuations, if they wish. Among the more interesting artefacts in the hoard were are fragments of three or four pennies of Cnut, King of England (1016-35), which were most likely all from the mint of Chester. Cnut the Great, more commonly known as Canute, was a king of Denmark, England, Norway, and parts of Sweden who ruled from the year 985 or 995 to 1035. Dr Mark Redknap, Head of Collections and Research in the Department of History and Archaeology at the National Museum Wales said the find will help historians to form a picture of the eleventh century Gwynedd economy. He said: “There are three complete finger-shaped ingots and one fragmentary finger-shaped metal ingot. “Nicking on the sides of the ingots is an intervention sometimes undertaken in ancient times to test purity, and evidence that they had been used in commercial transactions before burial. “At least four hoards on the Isle of Man* indicate that bullion retained an active role in the Manx economy from the 1030s to 1060s, and the mixed nature of the Llandwrog hoard falls into the same category. Police are appealing for information after a unique stone artefact was stolen from a church in Hovingham, near Malton. Some time between 23 May and 6 June 2015, offenders entered All Saints Church in Hovingham and stole a carved stone which was on display in the recess of a window. The statue, originally part of a stone cross, dates from the late eighth or early ninth century, and is likely to be contemporary with the shrine panel still preserved in the church. It is particularly notable for its ornate and accomplished carving. The stone itself is a sandstone from the quarries at Aislaby near Whitby, demonstrating the links between the Anglo-Saxon church at Hovingham and Whitby Abbey, which owned the quarries and exported stone for sculptural monuments to sites across North and East Yorkshire. The piece measures 51cm high, 23.2cm at its widest, and 12.8cm at its deepest. It is very heavy and will have required a vehicle to remove it. 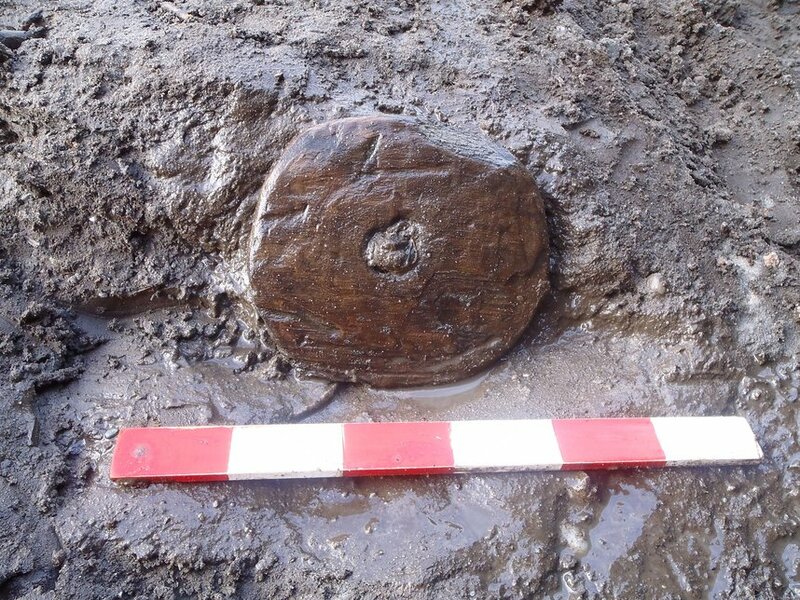 Archaeologists have discovered an Anglo-Saxon wooden butter churn lid at a rail development near Stafford. 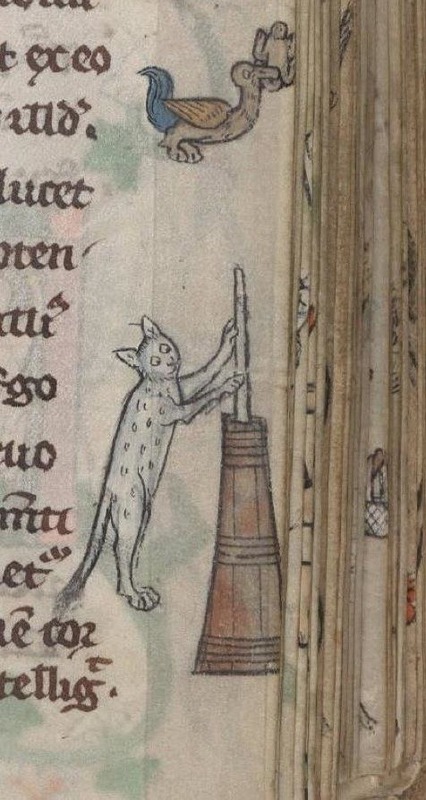 But radiocarbon tests have revealed the lid of the butter churn dates from the early medieval period. Dr Emma Tetlow, of Headland Archaeology is senior archaeologist at the site where Network Rail is building a new flyover and 11 bridges on the West Coast Main Line as part of the £250million Stafford Area Improvements Programme. Hundreds of thousands of tonnes of earth have been moved at the site to date, but checks are undertaken by Dr Tetlow during ground works. She said she was surprised but delighted by the news as there was so little evidence of this period archaeologically. “During this period this part of Staffordshire was part of the Mercian heartland and was populated by a pagan tribe called the Pencersaete. A number of Victorian stoneware bottles bearing the names of breweries from Bristol to Manchester have also been unearthed. Local residents will have the chance to view some of the objects and discuss them with Dr Tetlow and other colleagues working on the site at an information day in June. worked his will; they both shook. often think of, tenderly, and acquire. WORK began this week to discover more about Radcliffe Hall and Tower’s medieval past. The Close Park dig is being run by archaeologists from the University of Salford, who initially excavated the site in October 2013, and has so far attracted almost 100 volunteers. The team is hoping to mark out the medieval foundations of the structure, after a 15th century doorway and stone plinth bases from the great hall were uncovered last year. Organisers have been delighted with the response from the local community and say they are already making some fascinating discoveries, after selecting Close Park as one of their two flagship excavations in the Dig Greater Manchester initiative. Vicky Nash, who is leading the dig, said: “The main aim is to finally piece together the foundations of the medieval hall, but also the later development of the site. “The reason we came back is because we have dug here three times before and we have only just started to see evidence of the medieval hall popping up. “We’ve had a really good response from the people of Radcliffe. It’s been one of the most popular digs we’ve done. “This dig is only a few days in and we’ve had a lot of interest and are already uncovering a lot of what we came here to find. The dig is running until Friday May 15, with places still available in the final weeks of the excavation for volunteers to join in. The event is open to anybody over the age of 16, though younger volunteers are able to attend on Saturday, May 2 and Bank Holiday Monday, May 4, providing they are accompanied by an adult. An open day will then be held on Saturday, May 16 to showcase the team’s findings, with other stalls around the site showcasing the history of the area. The remains of an ancient structure described as being “as rare as hens’ teeth” has been uncovered under the floor of a Devon church. Excavations at St James Church in Jacobstowe have unearthed the ruins of what is believed to be the building’s original foundations, complete with a rear Western apse formation. Only two other similar structures have been recorded in Britain – including one at Canterbury Cathedral – and on-site archaeologists say it could provide new insight into the South West’s church-building history. Rod Lane, who is overseeing the excavations, said the “shock” discovery could date the church back as far as pre-Anglo-Saxon times. “What has been uncovered are the foundations of a western apse, together with the foundations of the former Eastern limit of the early church,” he explained. “This takes our knowledge of the development of church history in the southwest back much further than is currently known. “We know that Irish monks were coming to the West Country in the 5th-7th centuries so perhaps they came here too and formed a Christian community. The remains were exposed during works to replace St James’ pew platforms, which have been threatening to collapse for several years. The refurbishment project only recently got the go-ahead after the church secured financial support from the Heritage Lottery Fund and Devon Historic Churches trust. But when the floor and topsoil were removed, they revealed the building’s original Eastern wall and a semi-circular wall – or apse – at the Western end. The potentially significant find has already attracted specialists from across the country, including teams from English Heritage. But Mr Lane said the church was hoping to use it as an opportunity for residents to learn about local history. “We want to get the word out and involve the wider community,” he said.